Congratulations! You adopted a new puppy, a welcoming addition to your family...but now what? How do you provide the right puppy training , and what are you expected to do to care for your furry friend? They don't exactly come pre-trained, or even with an owners manual! Have No Fear. With a lot of love, and a little patience on your part, you can train your puppy to fit nicely within your family tree. puppy games will give them the exercise they need. Furthermore, many breeds of dogs have been bred to work for a living. These breeds require, and all breeds benefit from, activities that provide mental stimulation as well as exercise. Puppies who have these needs met are more content and easier to manage. 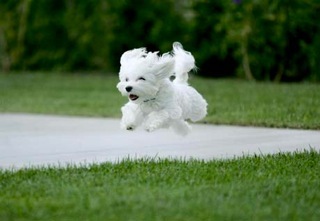 Conversely, puppies who do not get enough exercise are bored, frustrated and get in lots of trouble. Exercise is entirely your responsibility. Luckily, with a little creativity, finding ways to keep your puppy tired can be fun for you as well as your puppy. For some puppy game ideas click here. Planning the physical environment your puppy will be living in is a sure way to set up for success. If at all possible, fence in your yard or part of your yard. This is probably the best investment you can make to insure your puppy's safety. Shut the doors or gate off rooms that you do not want him to have access to. If he is going to be home alone for long periods of time, set up a "puppy proof" area by gating off your kitchen or utility room. If that's not possible, purchase a portable exercise pen that you can set up for him when you leave. 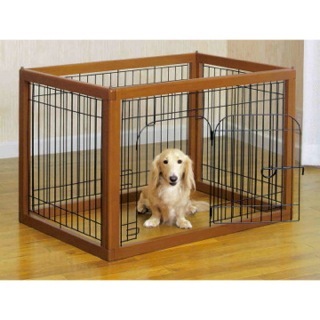 Crate training is a great wat to keep your puppy safe when you cannot watch him. Another important thing we can do for our puppies is to make sure that they are well socialized. Socialization while they are very young will help prevent many problems in the future. While this is especially true if you have a puppy who is unsure of himself or fearful, all puppies benefit from positive exposure to as many different life experiences as possible. 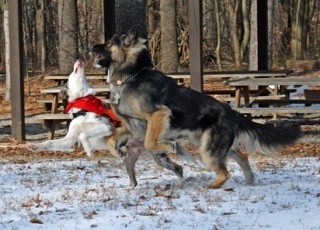 House Training is probably the most anticipated part of puppy training. Nowhere is good management more helpful than during house training. Until your puppy is trained, it will be your responsibility to make sure that he is never left unattended in an area you do not want him to eliminate in. All dogs, throughout their lifetime, need proper grooming, have their nails clipped and be examined by their owner and their veterinarian. Dogs that object to being handled are difficult to care for and, in extreme cases, may even have to be sedated for routine grooming and veterinary care. Fortunately, with a little patience and practice, your puppy can learn to enjoy being handled and at least tolerate bravely medical attention and nail clips. Dogs are social animals. Being left home alone is another life experience to which puppies must become accustomed. Even if you are home with your puppy and are able to have her with you all the time, it is important for her to become accustomed to periods of separation. This is equally true if you have an adult dog who is a new member of your family. Dogs who are unaccustomed to being alone can become so stressed when left that they engage in destructive behavior. Nothing is much cuter than a child and his puppy. Puppies and children seem to have a natural affinity for one another. Having said that, dogs and children are not always a good mix, and a great deal of diligence and good management are often required to keep this relationship safe and satisfying. Puppies living with children can be an enjoyable experience if some simple rules are applied. The cutest puppies can also become a handful if left to their own devices. Some of the most common problems barking, Jumping Up, Digging,and Biting can be resolved with a bit of consistency and patience. Please visit Helpful Hints and Tips for more ideas and suggestions. Return from "Puppy Training" to "Homepage"